The city of Rio de Janeiro is planning to demolish a precious, hundred-year-old Indigenous Cultural Center for stadium parking spaces. 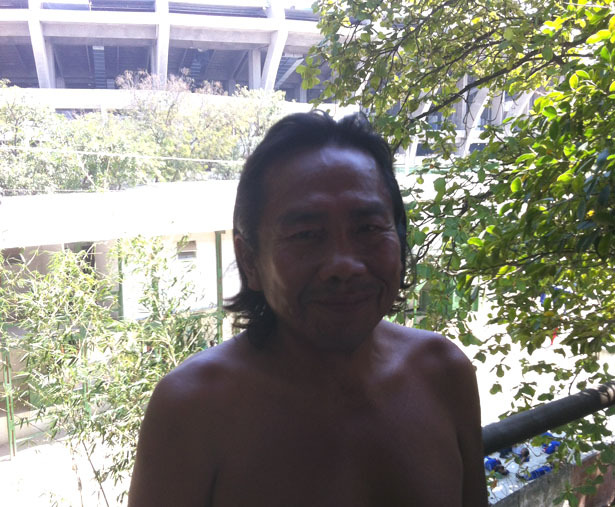 Carlos Tukano worries that the hundred-year-old Indigenous Cultural Center will be demolished for Maracanã Stadium parking spaces. Carlos Tukano is around 50, give or take a few years. He’s an indigenous Brazilian born in the state of Amazonas who worked for thirty years to build a collective organization of Brazil’s dozens of indigenous groups. Now he lives in Rio and cannot sleep. There’s no sleeping when a 1 billion Real ($500 million) fast-track construction project is happening next door, with twenty-four-hours-a-day of deafening noise: of jackhammers, cranes and whistles that mark the shift-changes of blue-overalled construction workers. It’s the price of living adjacent to perhaps the most famous sports arena on earth, Maracanã Stadium, now undergoing a massive facelift in preparation for both the 2014 World Cup and 2016 Olympics. That’s not the only reason Carlos can’t sleep. He lives with eleven other families in the remains of the city’s abandoned Indigenous Cultural Center, and all the residents fear they will be swept away with the construction’s debris. The families live in trailers next to the museum in protest of its dilapidation, disrespect and neglect. Founded in 1910, the Indigenous Cultural Center is an achingly beautiful three-story structure with twenty-foot-high ceilings and a world of history. While the formal museum is gone, there are now several makeshift exhibits and cultural displays put in place by the current occupiers, but the interior is in terrible disrepair. The floors are covered in rubble. The wrought-iron stairs still have their skeletal shape, but the handrails and marble stair treads are ripped out. Climbing them is like going up sixty feet on an diagonal ladder, and it’s a long way down. The entire structure could be rebuilt for 20 million real, a pittance compared to the Maracanã rebuild. This is particularly so considering that five years ago, the government spent 400 million reals to refurbish the stadium—changes that are now being completely demolished in the current renovations. With only a fraction of these funds, the Indigenous Cultural Center could become a symbol of Brazil’s rich and diverse history. It could even be an attraction for those coming to Rio for the World Cup and Olympics, a feel-good advertisement for the beneficence of the Brazilian state. Instead, it’s slated to become parking lots. The same logic that drives the bulldozing of the Indigenous Cultural Center into parking space mirrors the renovation of the Maracanã itself. The “Circus Maximus” of Brazil’s soccer-loving multitudes, with a capacity that could once stretch to 200,000, is being downsized, sanitized and utterly transformed. The new Maracana will seat only 70,000 people, ringed by luxury boxes, and is intended be sold off to private business interests after the 2016 games. Rebuilding the Maracana is a twenty-four-hour job: three eight-hour shifts, a constant flow of workers rebuilding their stadium into a structure they won’t be able to afford to enter. In the meantime, Carlos cannot sleep. Outside his bedroom hangs a billboard displaying for passers-by the new Maracana. It’s topped by a Brazilian flag with the slogan, “Brazil: A country for everyone.” From a distance, we can call this irony. For Carlos, it’s an obscenity.